Watching this movie at home will only serve to diminish its already shrug-worthy laughs. After setting the stage with half a dozen insultingly shopworn plot contrivances in its first five minutes, "Guess Who" -- a seemingly ill-advised cross between "Meet the Parents" and "Guess Who's Coming to Dinner" -- eventually finds its comedy footing by playfully dancing along the edge of political incorrectness. The meagerly amusing Ashton Kutcher plays a generic, kowtowing, romantic-comedy male dope named Simon, the kind of guy who quits his high-paying job on principle (cliché) but lies about it to his fiancée (contrivance) so she can find out about it on her own and thus break up with him (cliché), forcing him to win her back in the third act (oh, brother). This despite the fact that it's never clear what she sees in him in the first place. Simon also lies about his job to the girl's vociferous and intimidating father (cliché), whom he's meeting for the first time that very weekend (contrivance). The young couple plans to announce their engagement during a 25th anniversary party for her parents (there's a bad idea), which will include a renewal of wedding vows (a plot crutch only used by screenwriters desperate to find a climactic setting for a big finale). 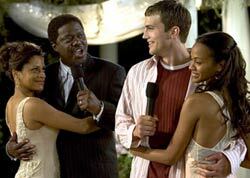 Having built its story arc around the kinds of dumb lies and misunderstandings that could be easily resolved if the characters would just level with each other for 30 seconds, "Guess Who" would collapse under the weight of its sheer idiocy if it weren't for the fact that Simon is white, his fiancée Theresa (Zoe Saldana) is black, and her father (Bernie Mac) is none too pleased about having that fact sprung on him. After taking a lot of mildly amusing abuse from Daddy (and Bernie Mac can dish it out with wicked delight), who is really more over-protective than prejudiced, Simon starts fighting back about halfway through the movie, and a rivalry takes hold that brings this comedy back to life. Kutcher and Mac become uproarious junkyard dogs of undercutting animosity, yet curiously build a begrudging respect along the way, as director Kevin Rodney Sullivan ("Barbershop 2," "How Stella Got Her Groove Back") pulls off a successful balancing act on the electrified high wire of racial humor. The movie even pokes fun at the highly subjective nature of what people consider offensive with a dinner scene during which Kutcher tells increasingly risky racial jokes, with Mac egging him on until one goes too far for his tastes. "Guess Who" sinks back into banality once the two men bond when both end up in the dog house with their women -- who after being depicted as the mature mates and sensible in their relationships fall into childish behavior themselves, stomping off during a disagreement and refusing to come home until the guys grovel for forgiveness. So by the time the credits roll, the movie's sharp comedy and sheer idiocy just about cancel each other out. Whether the resulting balance is worth the price of a movie ticket is just a matter of taste and tolerance.